Lightweight yet sturdy, this versatile set of stools can be used in a variety of settings. The butter-yellow leather on the curved seats contrast nicely with the rectangular lines and warm tones of the walnut frames. Single stool for $2500. Leather has been touched up and is in excellent condition; very minor wear to walnut frames. Paul McCobb for Calvin Furniture X-base stool with square tubular brass frames, flat brass stretchers and new luxurious virgin wool and mohair upholstery. Fabric swatch available. Unusual, rounded 1980s Milo Baughman stools on recessed casters. Newly reupholstered in smokey-gray cotton velvet. Signed "Thayer Coggin" with original tags. Jens Risom 'Floating' stool. Walnut base has been refinished. New tufted leather seat. A walnut bench with curved, upholstered seat. 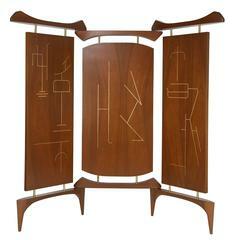 Designed by Jens Risom. Modernist bentwood stool by Thonet much like the style made famous by Charles Eames, circa 1950. Can also be used as an ottoman. Three Jens Risom bar stools. 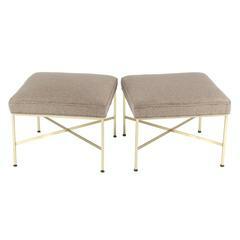 Stools have walnut frames with original naugahyde upholstery and brass foot rests. Stool designed by Erik Höglund for Kopparfly, Sweden, 1950s. Beech, hemp webbing and leather. Fantastic pair of 1950s stools upholstered with vintage Fornasetti fabrics, 1950s. 1950s Italian pair of hammered gold gilt metal foot stools. Decorative base. 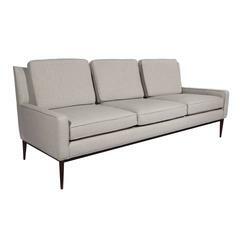 Newly reupholstered in textured cotton. Trademark Luigi Colli design pattern.